This book challenges the unchallenged methods in medicine, such as "evidence-based medicine," which claim to be, but often are not, scientific. 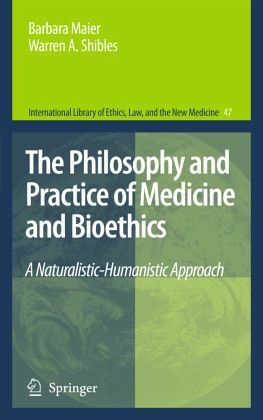 It completes medical care by adding the comprehensive humanistic perspectives and philosophy of medicine. No specific or absolute recommendations are given regarding medical treatment, moral approaches, or legal advice. Given rather is discussion about each issue involved and the strongest arguments indicated. Each argument is subject to further critical analysis. This is the same position as with any philosophical, medical or scientific view. The argument that decision-making in medicine is inadequate unless grounded on a philosophy of medicine is not meant to include all of philosophy and every philosopher. On the contrary, it includes only sound, practical and humanistic philosophy and philosophers who are creative and critical thinkers and who have concerned themselves with the topics relevant to medicine. These would be those philosophers who engage in practical philosophy, such as the pragmatists, humanists, naturalists, and ordinary-language philosophers. A new definition of our own philosophy of life emerges and it is necessary to have one. Good lifestyle no longer means just abstaining from cigarettes, alcohol and getting exercise. It also means living a holistic life, which includes all of one's thinking, personality and actions. This book also includes new ways of thinking. In this regard the "Metaphorical Method" is explained, used, and exemplified in depth, for example in the chapters on care, egoism and altruism, letting die, etc.